Hike to the "Le Pouce"
The apartments are located in Pointe aux Cannoniers, a quiet village in the extreme north-west of Mauritius. Splendid, powder-white sand beaches with crystal clear water are located in the immediate vicinity. Smaller shops and supermarkets as well Restaurants are in the immediate vicinity. If you want a little entertainment in the evening this can be at 3 KM distant Grand Baie (good bus connection). A tip from us: Bring a torch with you, since the street lighting is turned off in good time. 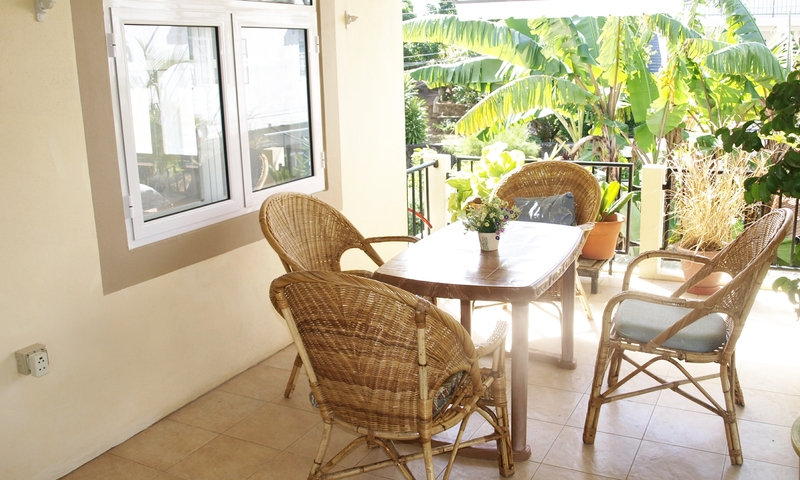 The apartments are located on the 1st and 2nd floor of our guest house, surrounded by an ever-blossoming, tropical garden. Because I live with my family on the ground floor, I can always help you with advice and action. Those who are looking for an apartment in Mauritius, it is a good address: We propose you 4 lodgings with all our servcies included. So to make your stay unforgettable, don’t hesitate to contact us for your reservation and explore all sites which existe in Mauritius with all easiness from your lodging. Landscapes of dream are waiting for you. : We will be happy to drive you toward our deprived transport service according to your wishes. Guest house Heliconia had been registered and approve according to the norms of the conformity with the requirements of the Tourism Authority.